Sym Bionic Titan is a pretty intriguing show. It mixes robots and aliens/giant monsters (Remember, this came out Before Pacific Rim!) The animation could be a turn off for some people, but the animation can be good when it wants too. The animation is actually bad on purpose for the designs so that everyone looks really ugly. It helps create the atmosphere and the facial expressions can be pretty funny. The fight scenes can be pretty good as well. The plot of the series is that 3 beings crashland on earth. Lance, llana, and Octis are the three main characters. Octis is an android, while Lance and llana are both Galalunians who resemble earthlings in just about every way. Their planet was taken over by the Muttradi and they are now in hiding at Earth. llana wants to go back and free her civilization, but Lance and Octis decide that keeping her safe is the top priority. One day they will go back and save the world, but not for a while. The leader of the villains is General Modula. His hat can shoot energy blasts and he’s not an opponent to be taken lightly. Lance and friends decide to go to school and keep a low profile. This way they can save the world when they need to do so, but they can also hide from the Muttradi. 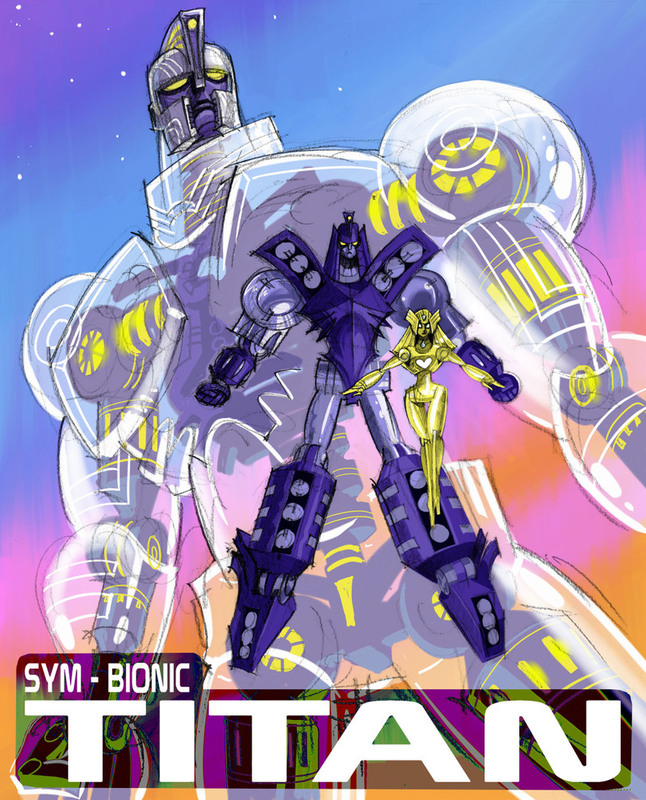 When the three of them fuse, they form Sym Bionic Titan, which is a large energy robot that is pretty powerful. This attracts the attention of the Government and G3. Both groups want Sym Bionic Titan to be defeated since he’s probably evil. The series definitely changes as it goes on and while it starts out as a happy school parody with action, it turns into more of a drama with the stakes getting higher and higher. The music is pretty solid for the first half, but during the second half the music definitely starts to vanish. Lance is a pretty solid protagonist and he’s the best character of the series. Not only is he an expert combatant, but he’s also a quick thinker. When they are captured by G3, it all rides on Lance to save the day. He was part of the army so he’s definitely the most experience. He’s good with many weapons and his robot form is pretty tough. llana is the princess of Galaluna and she never grew up as a fighter. She quickly adapts on earth and can emit barriers as well as shoot lasers in her robot form. She’s more of an optimist than Lance and always tries to become friends with the locals. Being trusting can definitely be deadly with all of the aliens running around, but she’s still a good character. She’s definitely the nicest member of the three. Octis is an android, but he acts pretty human. Like most androids, he develops human emotions thanks to his travels on earth. He has some pretty impressive super speed and his strength is also pretty formidable. It’s thanks to him that the main characters can form Sym Bionic Titan and if anything were to happen to him, their fighting capabilities would be drastically reduced. The leader of G3 is known as Solomon and he’s a pretty good character. He’s not afraid to take on the main characters in a fight and he’s pretty athletic. His abilities are at peak human to slightly superhuman. Since his division is in charge of aliens, they have some pretty sophisticated equipment on their side. General Steel is the leader of the Army and he’s a big rival of Solomon’s. They are always getting in each other’s way and General Steel doesn’t trust Solomon. General Steel doesn’t get much of a role until he builds the Hammer! With the Hammer, he can take on powerful opponents and even overpower Lance and llana. His best battle is against the Orga looking monster and it’s a solid fight. Kimmy and Jason are humans who introduce romance plots for llana and Octis. They definitely weren’t needed for the story and the romance didn’t add anything to the plot. They were basically filler, but no show can totally get rid of it I guess. I was glad that the show didn’t go the obvious route, so Lance and llana ended up staying as friends. Nothing more and nothing less! That’s how the main characters should always end up. Edwin is a pretty solid character, but he’s not the smartest character on the block. His nickname is meat and it makes you feel bad for him sometimes. llana’s dad is the King, but he doesn’t appear much. He never really gets to fight, but perhaps in a sequel show he would. The main villain also doesn’t get a chance to appear that often, since the show ended before he could really get going. Sym Bionic Titan is a pretty fun show. There are plenty of giant monsters and creatures that fight the main characters, (The best one being the monster from the final episode) and we even get a humanoid fight during the flashback part of the series. The monster violence can get a bit intense and the first episode with Kimmy was cringeworthy, but for the most part, the show was solid. The best episode involved underground racing and Lance always shows that he’s the best. It’s too bad that the series was cancelled, since things were definitely still solid. Hopefully, the series gets a sequel at some point. I’d definitely recommend the series if you want to see robots and explosions, or kaiju battles, or even if you just wanted to see the government infiltrate the high school to gather intel. This could be the series for you!